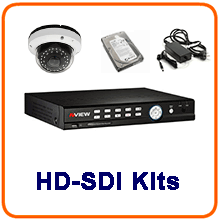 NESS High Definition Network IP kits come packaged with a four data input Network Video Recorder. Each kit has one camera included, but the extra camera can be added to the package. If you add additional cameras to the kit, you may have to add extra footage storage by buying an extra hard drive. For more information on camera to storage ratios see CCTV tips and tricks there is a link to a storage calculator there. These IP kits are complicated to configure if you don't have a good understanding of computer networking. Once the network is set up, you can access the cameras through a computer to set up all aspects including motion detection, privacy masking, focus, zooming, etc. 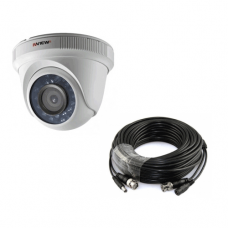 Being able to access a camera through the network is the big difference between IP CCTV and Coax cabled camera models. The NVR can be connected to your home or business broadband router and configured for off-site camera monitoring and control. 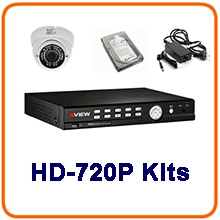 We can supply and fit any of these NESS CCTV System kits for sale on this site in Sydney, Illawarra .and the Southern Highlands of NSW. 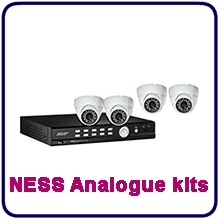 To find out more information on the installed prices of these NESS CCTV Kits. Follow the link to our installation website. 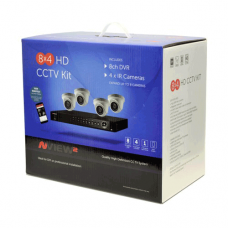 KIT CONTENTS 1 x two megapixel (1080P) Colour Ball Camera Infrared 20 meters with 2.8mm wide an..